Mickey Mouse is no Super Mario. He's the star of a more unusual kind of game on the Nintendo Wii, a game that starts poorly but finishes as one of the best hero stories of the year. 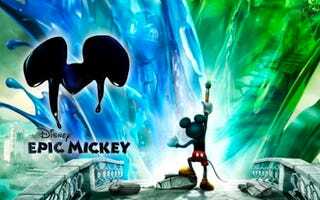 Mickey's newest starring opportunity is Disney Epic Mickey. It is a Wii exclusive that sends Mickey into a fantasy land of forgotten Disney characters called the Wasteland, arming our hero with a brush that can draw and undraw parts of the world. At a glance, the game would be mistaken as just another Mario derivative, an adventure that's all about jumping on platforms and beating up bad guys. But what the game proves to be, for those who can withstand some of its ugly, awkward moments, is a subtly thoughtful exploration of who and what Mickey Mouse is. People who love Disney lore and, believe it or not, people who enjoy the kinds of video game adventures such as Fable or Mass Effect that enable players to steer their character down one moral path or the other. It might be hard to convince you that this game uses Mickey Mouse's popularity to great narrative effect, so instead consider that this is one of the only exclusive Wii games made by a top American game creator. Ever. What Was The First Draft Of This Review? About two hours into the game and not enjoying it, I scratched out the following, which I believed could summarize the limited initial pleasure of playing Epic Mickey: "Epic Mickey is the kind of game that asks you to press a button to open a door and then asks you to press it again if you're sure." But It Got Better? Definitely. At its start Epic Mickey feels like a minor mess. Mickey himself looks great, one of the best-animated lead figures in a game this year. But he begins his adventure in a world of muddy colors and rough edges, hopping around and spraying his brush with less delightful results than we got from the water-spraying gameplay of 2002's Super Mario Sunshine. Mickey's new world is filled with money, treasure chests, pins and other baubles of achievement, while Mickey's body begins to attract orbs of light the way a sweaty man attracts flies. The lights represent some sort of questionably-relevant alignment of Mickey as a mouse who paints more than he erases or erases more than he thins. All of this… why? The game's short side-scrolling sections are beautiful homages to Mickey classics but are annoyingly mandatory when travelling between any realms in the game. And? And it did get better or not? Two or three hours into the game, almost everything clicks. Mickey passes through the game's forgettable early levels and winds up on Mean Street, a hub from which he explores wonderfully twisted versions of classic Disneyland themes including a superb Ventureland pirate zone that includes a most unusual Peter Pan. In these lands he'll paint buildings into being, splash thinner to erase enemies and go on quest after quest for the games dozens of supporting characters. The hint of what's special here emerges as Mickey scales a mountain of Mickey Mouse memorabilia, some of it so junky that just as soon as you wonder if there is some sort of Mickey Mouse critique in this game you may realize that that is, in fact, what this game is. So the game is fun? That painting and thinning stuff doesn't seem great and not everyone cares about the exploration of the soul of a Disney mascot. The gameplay is ok. In some areas, thinning the ground and finding a cave below it provides the kind of secret-finding pleasure usually hidden in Metroid games. The mechanics for painting and thinning are decent, relying on a point-and-shoot system with the Wii Remote, though the controls are greatly compromised by the game's bad camera. The camera can only sometimes be manually adjusted by the player and seldom points where it should. OK. So the gameplay is so-so, but this critique-of-Mickey thing is good? That sounds weird Early in the game Mickey meets the ruler of the Wasteland, Oswald the Lucky Rabbit, a real Disney character who Disney lost the rights to for some 80 years, during which was created the iconic mouse. The game's Oswald is believably irked and envious of Mickey's success. He sits in a throne atop all that Mickey junk, the arm-rest of his throne endlessly looping Mickey's breakout Steamboat Willy cartoon. Oswald is skeptical of Mickey who, true to his mischievous nature, harbors the secret that he is the reason Oswald's Wasteland has been invaded by monsters. Mickey is the reckless celebrity whose very existence pains his forgotten older brother. This is an odd role to play in a video game and one which makes all the choices about how mischievous to be in the game — which buildings to thin to the ground, for example — feel so much more meaningful. Suddenly, being surrounded by the green sparks of a mischievous Mickey rather than the blue of a more helpful one feels like a cloak of guilt, one that can be shed if you want to play that way. How does this character stuff play out? Is this like Deus Ex? More than screenshots and trailers would suggest, Epic Mickey really does feel like a descendant of creative director Warren Spector's celebrated team creation Deus Ex. In that PC classic as in Epic Mickey, the choices of the hero feel like they matter. The more carefully you pay attention to Epic Mickey, the more you'll notice that so many of the game's over 100 quests — help this character, save that village, etc — have more than one way to complete them. That's the kind of malleability enjoyed by fans of Spector's previous work. And it all ends well? Actually, by the last couple of hours Epic Mickey begins to feel like a Prince of Persia game, which is odd and, well, another story. Epic Mickey is a heftier, more intellectually intriguing game than one might gather from any initial impression that mistakes it for Super Mickey Bros. Had Mickey's designers programmed a less frustrating camera and found a way to draw Mickey's world in a way that was appealing as how they drew Mickey himself, this slow burn of a game could have been great. It is, nonetheless, a smart curiosity. The game rewards dedicated players who plumb its secret pathways and travel along a heroic path that feels so unlike — and so much more interesting than — those in most of the video games we get to play. Disney Epic Mickey was developed by Junction Point and published by Disney Interactive Studios for the Nintendo Wii, released on November 30. Retails for $49.99. A copy of the game was given to us by the publisher for reviewing purposes. Completed more than 100 quests in the course of a 15-hour playthrough of the single-player game. And yes, dear video game, I am sure I want to open the door. I already pressed the button saying I wanted to. Don't make me as angry as Donald Duck.